Jesus said the greatest will be the servant of all, so how do you become a servant to all? One of the worse mistranslations in the Bible is where the word “servant” is translated from the Greek word, “doulos” which doesn’t mean servant but slave. Jesus tells us that we are to serve others but when He is speaking to believers, He refers to them (as does Paul and others) as slaves and not servants. Servants only work for someone and can go home after their job is done and they can own property but the slave is owned by his or her master and all that they own is not theirs but the master’s. There is also a relationship difference. The servant gets paid for what they do and leave after they are finished serving, but the slave stays with the master and his or her family and, over time, they actually become part of the family. They become as close as one of the family members too to the master or owner. Even so, they can do nothing without the master’s permission as they can do nothing outside of the master’s will. Their life is not really their own because they are subject to the will of the master. In that sense, we who have been born again are now blood-bought by Christ. Paul says “you were bought with a price” (1st Cor 6:20). 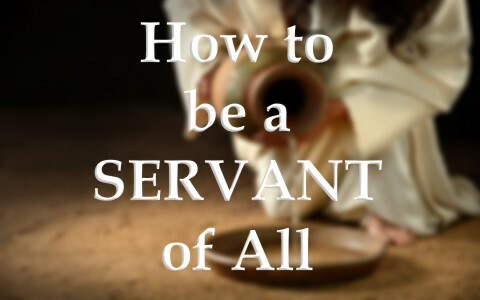 How does a person become the servant of all? For one thing, a servant is not known by who they serve as much as by how many they serve. When I came to the church I am at now, I never felt it was below my dignity (or anyone’s) to scrub the toilets or clean the kitchen or scrub the floors. One way to become a “servant of all” is to find the jobs of service that few, if any are willing to do. I never had a problem with too many people trying to take over what I was doing or eager to sign a signup sheet where certain duties for the church are listed. What I also discovered is when I started doing things that no one else would, it would inspire others to do the same. Of course, that’s not the reason I did it. I did it because it needed to get done. I never told anyone about it; I just did it. Only later when someone noticed the bathrooms were clean did it come to surface that I did it. When no one volunteered to say, “I did it,” they all looked at me. I just smiled. That was enough. My mentor, a retired pastor in his 80’s, told me that no one will follow unless you are willing to lead and so that’s what I did. Why not look to do things that no one else will do. People were not waiting in line to clean the toilets, the kitchen, or empty the diaper pail, so I just did it. By all means, I don’t want you to think that I am the “greatest of all” by serving in these areas; it’s only because I wanted to and felt that it just needed to be done. That’s all! I already discussed that most of the time we read the word “servant” in the New Testament, it actually is “slave” (doulos) and as we have read, that is a huge difference. One example is in Matthew chapter 14 where Jesus refers to Himself in quoting Isaiah the Prophet and says, “Behold, my servant whom I have chosen, my beloved with whom my soul is well pleased” (Matt 12:18) and the word servant in the Greek is “pais” which means servant, but elsewhere, when referring to believers, it says, “the tenants took his servants and beat one, killed another, and stoned another” (Matt 21:35) which is “doulos” where the word “servant” is used. God never refers to Jesus as a slave nor does Jesus ever refer to Himself as a slave, but most of the time in the New Testament that the word servant is used it is referring to believers as a “slave,” and again, there is a great difference between being a servant and being a slave. The master has the power to take the slaves life, but not so with servants. Personally, I think I’d rather be a slave of Christ and not a servant because if I’m only a servant, then I’m not really the property of the Master, Jesus Christ. When the Bible commands us to be servants of one another, the word is truly “servant” (“diakonos”) from which we get the word “deacon.” An example of this is where Jesus “sat down and called the twelve. And he said to them, “If anyone would be first, he must be last of all and servant (“diakonos”) of all” (Mark 9:35), so when we are to serve one another, it is not like an indentured slave to Christ but a “diakonos” servant, or literally “a waiter, one who serves food and drink.” This is why the early church established the office of deacon. The deacons allowed the apostles to preach the gospel and not tie up their time with serving others who could better be served by others in the church. God never calls us to be slaves to one another. That is reserved for believers in their relationship to Jesus Christ Who not only purchased us with His own blood, but owns us because He gave His life as a ransom for us (Mark 9:45), so “If anyone would be first, he must be last of all and servant of all” (Mark 9:35b), including every single member in the body of Christ, the church. If you want to be a servant to all, find places where the saints need to be served. We had a man who was looking for a church home and he asked me, “Is there anything that I can do for the church,” and what impressed me about this man’s question (Mike) was that he already got it! He wanted to serve the church in some capacity. Somehow he knew that he was supposed to be a part of the church and since the church has many members, and each member has a God-given purpose, he is seeking to find his purpose in the church. What a blessing for us, but I believe it will bless him even more. To be a servant of all is to find a place to serve all. Whatever needs to be done in the church or for the saints, all you need do is to look around where a need is and fill it. That’s how to be a servant of all. And that’s what you want because “whoever would be great among you must be your servant” (Matt 20:26). More about being a servant here: What is Servant Leadership? Previous post: Has Christianity Helped Societies?